V. R. Basili 在 1984 開始逐步提出 Goal-Question-Metrics 方法  (後有人稱整個相關概念成為一個 paradigm), 而常見的引用以及較為完整的說明可以在  找到. 關於 GQM 的內涵, 目的以及用處在  中已有說明, 在此不贅述. 我認為 GQM process 應該可以被清楚地分為兩個 phases. 在 Definition Phase 目的是推導或是組合適當的 metrics. 而在 Utilization Phase 則是利用推導的過程得到的產品, 包含 metrics, question 與 metrics 之間的 associations, goal 與 questions 之間的 associations, 自 bottom-up 去檢驗是否 goal 有被滿足, 從而出發 refinement actions. 而在這之中, 實際對於 data 進行 measurement 就發生在 utilization phase 的第一步. 同時這張圖也說明了 GQM 與 software measurement 之間的關聯. 在 GQM 身上事實上還留有許多相當模糊的空間. V. R. Basili 在  中事實上也是透過 examples 來說明 GQM 的使用而已. 然而這就留下許多問號, 例如究竟我應該選擇哪些 objects 設立 goals ? 怎樣的敘述較像是一個 goal ? 怎樣自 goal 推導出 questions ? 怎樣的敘述比較像是一個 question ? 怎樣為 question 定出合理的 metrics ? 這之中最大的問題可能還是在於 questions 身上, 也就是 operational level 的決定. 在我看過的書以及 papers 中, 對於怎樣使用 GQM 似乎還沒有一個比較明確的 rules 出現. 先階段似乎只能夠根據一些 examples, 或是看看別人的 papers 怎樣利用 GQM 進行說明, 來仿效使用. V. Basili, G. Caldiera, and H.D. 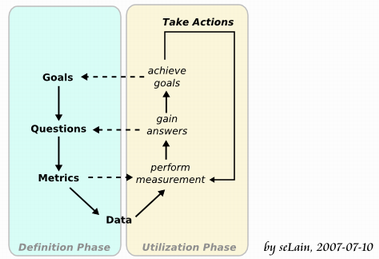 Rombach, The Goal Question Metric Approach, Encyclopedia of Software Engineering, pp. 528-532, John Wiley & Sons, 1994. This entry was posted on 下午9:53 and is filed under project management , software measurement , software quality . You can follow any responses to this entry through the RSS 2.0 feed. You can leave a response, or trackback from your own site.